We enjoyed the drive back to Nairobi from Eldoret. Even though we bring things to listen to (such as General Conference), we usually just end up talking and watching the scenery. We made the trip home to Nairobi in 5 hours. During breakfast we had talked with the manager and he told us to have a safe flight back to Nairobi. We said, "No, we are driving." "Oh, you have a driver?" he asked. "No, we drive ourselves." He was astounded. He asked how long it takes us and when we said 5 to 6 hours, he said, "Wow, you must drive like a Kenyan!" Actually most foreigners have drivers and don't drive themselves. But all senior missionaries drive here in Kenya and also in Tanzania. We quickly get used to driving on the left (and having the steering wheel on the right side of the car). It's no crazier than driving in Chicago! Once you know where you're going, it's not hard. (Be sure to click to enlarge the pictures). Interesting to see evergreen trees on the equator. We passed the equator sign but didn't stop to get a picture. This picture wasn't taken right on the equator but close. At the equator line our GPS said that we were at an altitude of 2790 meters (9154 feet). Later we climbed even higher to 2847 meters (9340 feet). That's pretty high up. No wonder it gets so cold. I asked LeRon why it was colder higher up. Shouldn't it be warmer because we're closer to the sun? I remember asking that question when I was young and I'm still asking it now that I'm old! Ha ha. "Pray until something happens." We had fun talking about what would happen . . . Pray until the rocks fall off the truck. Pray until a tire blows. Pray until you break an axle because you're overloaded. Pray until you get stopped by the police for being overloaded. Are you supposed to stop praying when something happens? This was our conversation for a very long time! This picture is for my friend Katia back in Taber, Alberta, who thought that because we were going on a mission to Africa, we would be living in a hut. Well, here's a hut for you, Katia. They do exist! But not for senior missionaries! Tractors of any kind always catch our eyes, being the farmers that we are. I love those flat-topped acacia trees. When a truck (or any vehicle) has a breakdown, they put tree branches behind and in front of it to warn other drivers. Why not use what is handy? Sometimes there's no extra lane to pull over to so the truck simply stops where it is right in the driving lane. Very interesting. But you have the tree branches to warn you. Be sure to click to enlarge. The long rains have started so everything is greening up. But I think the rains have come too late and will be too little so most of Kenya is still in a drought situation. Except for down on the coast at Mombasa where it has rained so much that even buildings collapsed. It took a friend of ours 5 hours to drive across Mombasa a week or so ago. And Mombasa is not that big of a city. I took this picture to remind myself that this is logging country. Who would have guessed that there would be logging on the equator? 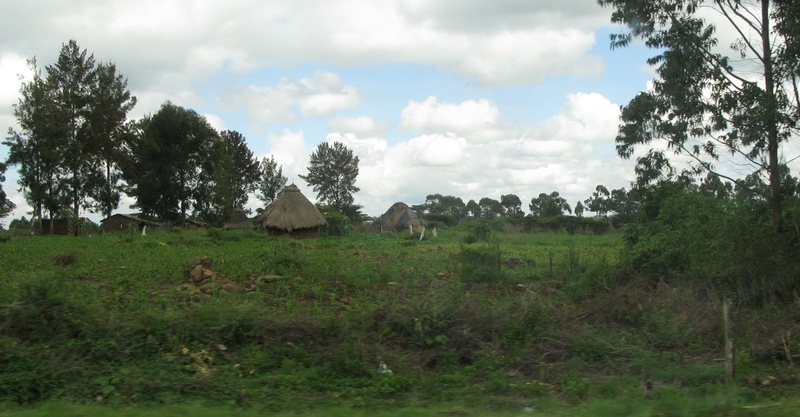 And I took this very blurry picture as we were speeding by to remind myself that life here in Kenya is a lot more laid-back than it is in the West. We often see people just sitting at the road side or laying on the grass in the middle of the day. There must be a happy medium between this life and the go go go of life in the West. LeRon is always happy to see evidence of farming! Notice the yellow jug tied on. They usually carry water in jugs like this. We keep seeing these bags of something for sale and we still don't know what's in them. We had fun guessing though. Maybe it's charcoal. Maybe it's some kind of cattle feed. Maybe it's slabs of rock. Who knows? Look closely and you'll see a pivot busily sprinkling water on to the thirsty ground. This time I counted five pivots around Nakuru. It made us a touch homesick. A load of cabbages going to market. This time the load of cabbages is pulled by a donkey. We've seen heavy loads pulled by three donkeys but that is unusual. Donkeys are definitely beasts of burden here. Close to where we stay in Nairobi is a "donkey sanctuary". I found out that it's a humane society for abused donkeys. We've seen people beating their donkeys and we've seen a single donkey pulling a load such as in this photo with the owner whipping it to make it go. So sad. I'm sure most owners treat their donkeys well because they depend on them. Hopefully anyway. I love the red soil with the green grass and foliage. And there are always people walking along the red dirt roads. People walk everywhere here. No wonder there are so few overweight Kenyans. The buses are always loaded sky high. This one has lots of yellow jugs for drinking water. Pineapples going to market. They are delicious here. Ha ha. Thanks for that Bruce! I see that you are reading my blog. I'm just working on the posts now and I've got a couple more to do but they probably won't get done tonight. LeRon is cooking me some supper. Love you and Sara lots. Glad you had the Mauritius experience. I meant that you are reading my blog right now as I am writing. And even though it says 10:30 a.m., it is actually 7:30 p.m. here in Nairobi.